What is PetSafe(R) Stay + Play Wireless Fence(R) System? The PetSafe® Stay + Play Wireless Fence® system keeps your dog safe in any outdoor setting like your yard, campground, or your friend's or family's homes. It creates a circular boundary that covers up to 3/4 of an acre. The PetSafe® Stay + Play Wireless Fence® system comes equipped with a sleek, rechargeable transmitter that looks like an ordinary household appliance and a receiver collar for your dog's neck. The best part is that the PetSafe®Stay + Play Wireless Fence® system is not visible and is completely wireless, so you don't have to worry about tripping or mowing over cords in your yard. NOTE: If you have multiple dogs, extra collars are available at an additional cost, sold separately. 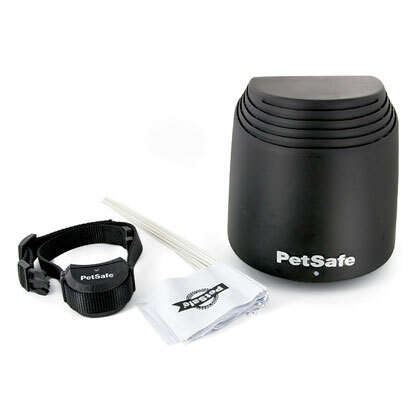 The PetSafe® Stay + Play Wireless Fence® system works by creating a radio signal that creates a circular boundary area. This boundary area is created by a transmitter that can either be placed on a flat surface or hung on a wall. When your dog goes out to play, you simply slip a receiver collar on your dog's neck that signals your pet when he or she is going past the boundary area. It offers 5 levels of static correction and a tone-only mode for training purposes. Also included are flags to set up along the perimeter of your yard where the transmitter reaches to remind you and your pet where the boundary lines are. The transmitter is completely portable so there is no wire you have to bury or worry about tripping or mowing over it. You can also take it with you anywhere you are spending time outdoors. The receiver collar contains an Li-ion rechargeable battery that is usually ready within 2-3 hours, and can last up to 3 weeks. It also comes with long and short contact points. The long contact points are great for long-haired dogs. The receiver collar is waterproof and recommended for pets that weigh at least 5 lbs with a neck size of 6" to 23". When beginning to train your dog with the PetSafe® Stay + Play Wireless Fence® system, put the receiver collar on tone-only mode and then work your way up to the correct setting that works for your pet. For in-depth installation details, please read the PetSafe® Stay + Play Wireless Fence® Manual. Setting up the Transmitter: First, choose the location you would like your transmitter to be. Keep in mind the size of your yard and the area you would like to cover (the Stay & Play covers up to 3/4 of an acre). The transmitter works best when it's in the center of the area you would like covered. Make sure the transmitter is 2-4 feet off the floor and in a dry, well ventilated spot. You can mount the transmitter on the wall with the mounting template on the back of the transmitter. Keep the transmitter 3 feet away from any large metal objects, and near an outlet to ensure maximum coverage. Never place anything on top of the transmitter. For 45 feet or less coverage area, use the LOW setting. For areas greater than 45 feet, use the HIGH setting. Setting up the receiver collar: After you set up your transmitter, charge the receiver collar. The charge on the collar should last 2-3 weeks depending on how many times your dog challenges the boundary. Make sure the collar is fully charged before use and press and hold the mode button to turn on the collar. Test the collar by using the provided test light tool on the receiver collar. Turn the collar on and walk out into your yard. The collar will flash and beep as you approach the boundary area and the light on the test light tool will illuminate. This testing works best with two people. One person should be at the transmitter to adjust the device for the desired area, while the other person walks in the yard to test the collar. Once you have the boundary area detected, place flags around the perimeter to help train your pet. The collar should be snug and touching your pet's skin. For long-haired dogs, change out the contacts point for maximum effect. NEVER pull the collar to put pressure on the probes. Remove the collar at night. The collar should never be worn more that 12 hours. While charging, the light is a solid red, and changing to solid green when complete. Always begin training your pet on the lowest correction setting. Never use a leash with the PetSafe® Stay + Play Receiver Collar. The PetSafe® Stay + Play Wireless Fence® system is recommended for dogs weighing at least 5 lbs with a neck size of 6"-23". Keep both the transmitter and the receiver collar in a well-ventilated area when not in use.